My paintings, synthesized from observation and imagination, are a dialogue between the seen and the remembered, the planned and the surprise that happens on the canvas. 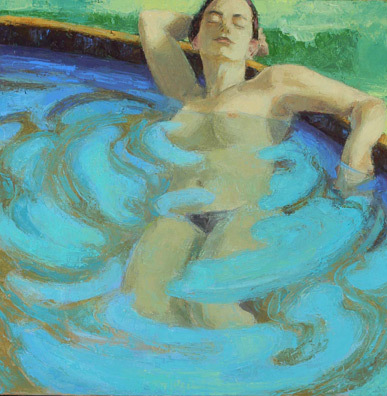 In these images of water and women a tension is created between representation and abstraction as the figures appear and disappear in the fluid surfaces of each painting. Water is a mysterious and vital element. It is both immensely powerful and at the same time soft, intimately linked to birth and sustenance as well as to death. Working with both brush and palette knife, I layer one color over another. In this way the contrasts of opacity and transparency, of thick and thin, of solid and liquid are the dance of my paintings. Deirdre Leber grew up in New York City, frequenting museums and attending the Art Students League in starting at the age of nine and throughout high school. She received her BA from University of Pennsylvania, Philadelphia, PA and her MFA, with a concentration in painting, from Brooklyn College, Brooklyn, NY. During her time at Brooklyn College she was awarded three merit scholarships. In the summer of 1981 she attended the Skowhegan School for Painting and Sculpture program in Skowhegan, ME. Beginning to exhibit in 1986 she has had solo shows at the Coffey Gallery, Kingston, NY; be gallery, High Falls, NY; and Woodstock Artists Association, Woodstock, NY and participated in group exhibitions at commercial galleries, university galleries and not-for- profit art centers in locations across the country such as Palo Alto, CA; Santa Fe, NM; Cullowhee, NC; Corvallis, OR; Easton, MD and New York City. Her work has been included on the cover of the magazine Art Calendar and in the 2008 Women Artists Calendar published by Syracuse Cultural Workers Peace and Justice Publications. For the past 10 years she has lived and worked in New Paltz, NY.